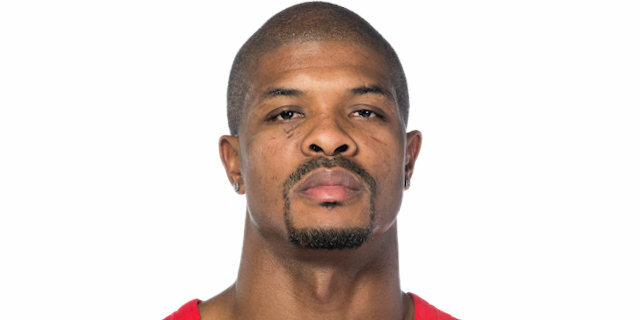 Defending champion Olympiacos Piraeus held on for an 82-81 victory over EA7 Emporio Armani Milan on Friday at the Peace and Friendship Stadium to finish the Turkish Airlines Euroleague Regular Season in style. The Reds reeled off their seventh straight win to improve to 8-2, which left them second in Group C on a tiebreaker behind Zalgiris Kaunas. 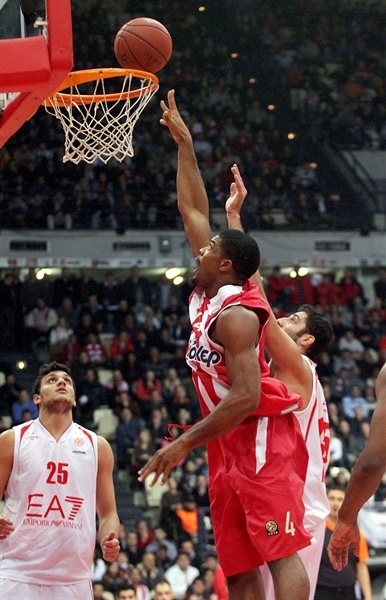 Olympiacos had a slim lead for most of the second half before Armani rallied to set up a thrilling finish. 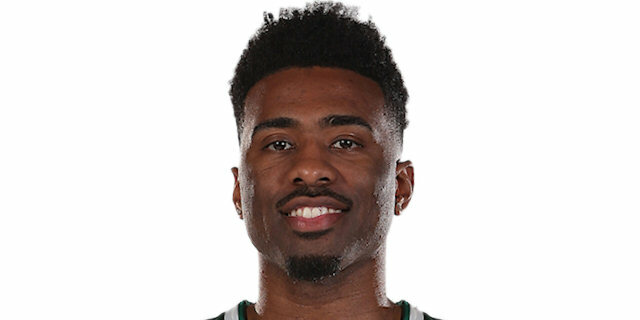 The last three-and-a-half minutes featured eight lead changes before free throws set up the last play: Milan’s Keith Langford missed a long jumper at the buzzer, leaving the win for the home side. Armani lost its third straight game to drop to 3-7. It finished the regular season in fifth place and will not partake in the Top 16. Vassilis Spanoulis, who received his bwin November MVP trophy before the game, paced the winners with 18 points, Kyle Hines scored 16 and grabbed 7 rebounds, Acie Law tallied 14 points and 5 assists, Kostas Papanikolaou scored 12 and Josh Powell 10. Langford led Armani with 21 points, former Olympiacos star Ioannis Bourousis posted 8 points and 7 rebounds in the first quarter alone before finishing with 13 and 12 and Alessandro Gentile added 13 points in defeat. With boos from his former fans in the background, Bourousis drained a three-pointer to open the scoring for the visitors, however a wave a cheers followed as Spanoulis soared through the paint for a basket-plus-foul. Bourousis put the visitors up 3 again, but before long Evangelos Mantzaris connected from deep for the hosts and an 8-6 lead. Spanoulis and Langford traded baskets before Powell took his star turn. Powell rejected a Bourousis layup on defense and then raced downcourt to take a pass from Mantzaris and flush down the alley-oop slam to make it 12-8. Langford led Milan back to tie the score and then to take the lead. Bourousis followed with a basket-plus foul to cap a run of 9 unanswered points. Law drove to end the drought. 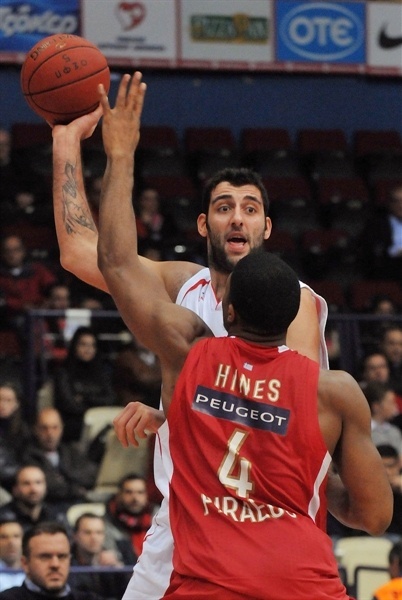 Baskets by Gentile for Milan and Hines for Olympiacos made it 16-19 through 10 minutes. Armani found its groove early in the second quarter as Gentile and Nicolo Melli canned triples on consecutive possessions to put the visitors ahead 20-27. Law fed a cutting Hines for a layup-plus-foul and then he found Stratos Perperoglou to cut the gap to 2. After a Milan timeout, Hines muscled his way to the tying basket, however Melli fired in a triple and Rok Stipcevic another to put the visitors in control again, 27-33. The Reds came right back through Hines and Law. Kostas Papanikolaou continued his torrid three-point shooting this season with a triple to knot the score at 34-34 with three-plus minutes left in the half. 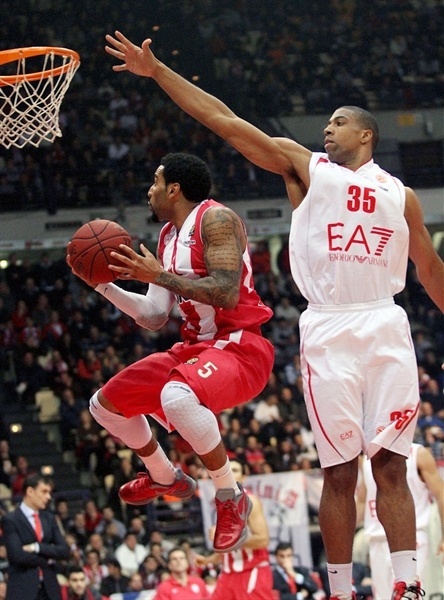 Spanoulis put the hosts on top twice, but each time Milan matched him. The third time, with 2 free throws after a technical foul on Omar Cook, Law followed with a baseline layup and Spanoulis rifled in a triple in the last 10 seconds of the half to make it 45-38 at the break. 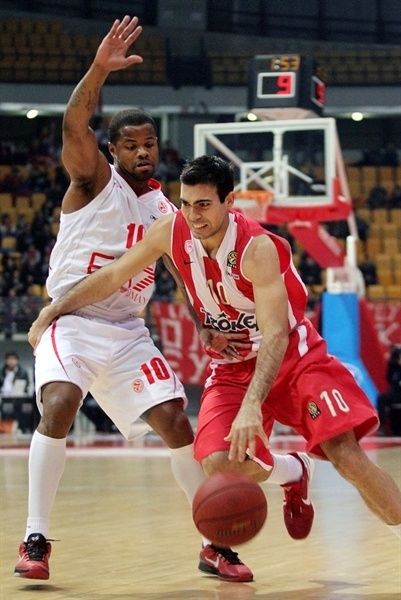 On the first possession of the second half, Papanikolaou stretched the lead to 9. Cook, with a steal, layup and three-pointer, drew his team within 47-43. The teams traded scores over several possessions with the hosts always maintaining at least a 4-point lead. Langford, with scored via goaltending, drew a foul and sank the resulting free throw, brought Armani within 53-50 midway through the quarter. However Papanikolaou and Powell restored a more comfortable cushion. Law bettered a Gentile jumper with a triple as the hosts got to 60-52. Bourousis hit from downtown to bring Armani back within 3. Gentile further cut the deficit before Langford, after a technical foul on Powell, tied the score from the line, 62-62, at the end of the quarter. Perperoglou and Law pushed the Reds ahead early in the deciding period, but Milan refused to go away. Melli sank a long jumper to make it 68-66. Hines converted a basket-plus-foul and a free throw on a later possession put the hosts up 6. Milan quickly roared back through a Langford layup and a Cook three-pointer. Langford backed Law down in the post to put his team ahead 72-73 with 3:20 to go. Olympiacos heroes Georgios Printezis and Spanoulis and Armani stars Langford and Bourousis traded points and leads for their respective teams. Hines rescued a missed Papanikolaou three for a basket and a 78-77 edge with a minute left, but Bourousis threw down a ferocious two-handed jam at the other end. The run of baskets continued as Papanikolaou sniped a three from the corner to put the Reds up 2 with 25.2 seconds to go. A free throw contest ensued, which after a pair of Papanikolaou misses with 11 seconds left gave Armani the final ball down 1. Langford went for the win with a deep two-pointer, but it clanged out and left the Reds with another win to celebrate before the Top 16. "We finished the regular season with an 8-2 record, which is good. The game versus Armani Milano was special, because our second-place finish was almost decided, so we had to find motivation to play up to our usual standards. We didn't find rhythm through our defense and our shooting percentage behind the arc was very bad. Armani Milano has a lot of talented players and they are really good in one-on-one situations. Now we have to get prepared for the Top 16, which is another story. I don't want to talk about possibilities or whatever, since our target is just to focus on the next game. We have built a strong character and this is very important. Both groups are tough and the Top 16 is very long, so many things can happen from now until April." "Congratulations to Olympiacos, but this is something that my players deserve as well. With the exception of the last three minutes in the first half, we played a good game, but we didn't manage to get the victory in a game which was decided by the details. Unfortunately, our Euroleague itinerary ends here, as the group was very tough, with five teams able to make it to the Top 16. We lost many games at the buzzer and we are very sorry not to be in the next round. Now we have to make some changes and focus on the Italian League." "It was a very difficult game, because Armani Milano was still hoping to make it to the Top 16. We beat them and expect to play better in the next round. 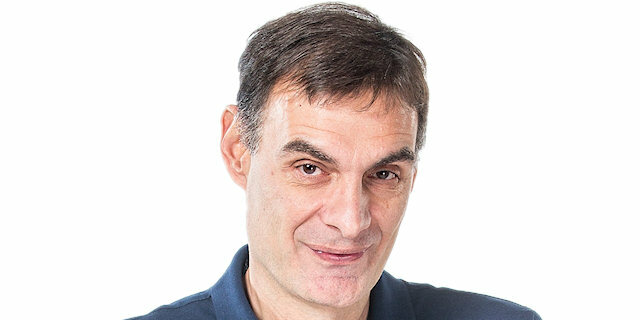 I am happy because Olympiacos registered its seventh consecutive victory and we are on a 14-0 run including the Greek League, but it is too early. We have to keep out rhythm because the Top 16 is much tougher." "I think that everything we have done so far is a great accomplishment. Although we didn't start well, we proved that we have character and quality to reach our goals in the season. We finished the regular season with a victory over a talented team and look forward in playing better in the Top 16. I am sure we can improve our game, both on defense and offense, as a team and individually." 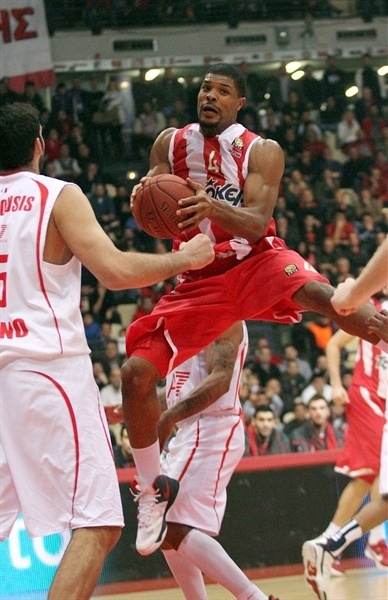 "Olympiacos played a good game and it was not easy for us to win here. We tried to beat them, but the situation was complicated. 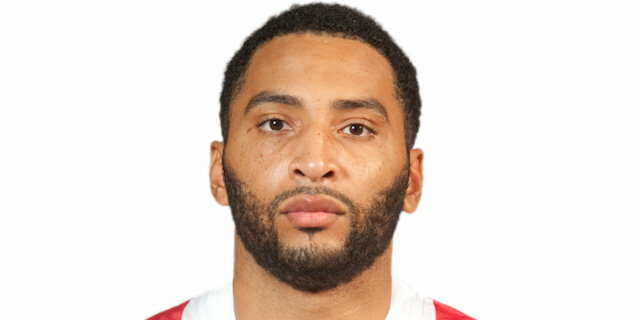 Now he have to go back and try to win the national championship."